A English Poker Open Main Event *must play* main event seat ($3,500 USD). $1,500 USD cash in your Cake Players account to help with travel expenses. Entry to the EPO Welcome Party, September 17th on the HMS President. Official Team Cake gear pack. Remember you can win your EPO Main Event Seat Prize Package from as little as… absolutely nothing! There are five freerolls running every single day that are the starting point of a free route to an English Poker Open 2012 Seat! The top 3 players from every freeroll go through to a special Saturday 10 Seat feeder to Sunday’s EPO Final. Sign up for Cake Poker and check the tourney board once you’ve logged into the Cake Poker software. 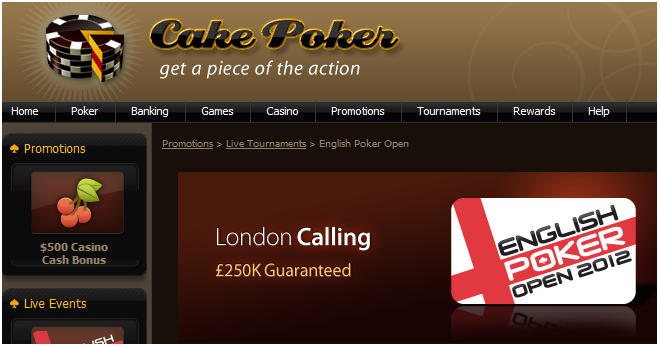 Home » Rakeback News » Only 2 Cake Poker EPO Main Event Seats left to be won!